It is no secret that some atheists who were raised as Christians enjoy certain aspects of Christmas. Usually, it is the more secular parts of the holiday they enjoy, but some have retained a fondness for the Christian music or the pagan decorations condemned in the Christian bible. But what about those atheists who find nativity scenes appealing and just aren't crazy about all the Jesus stuff? 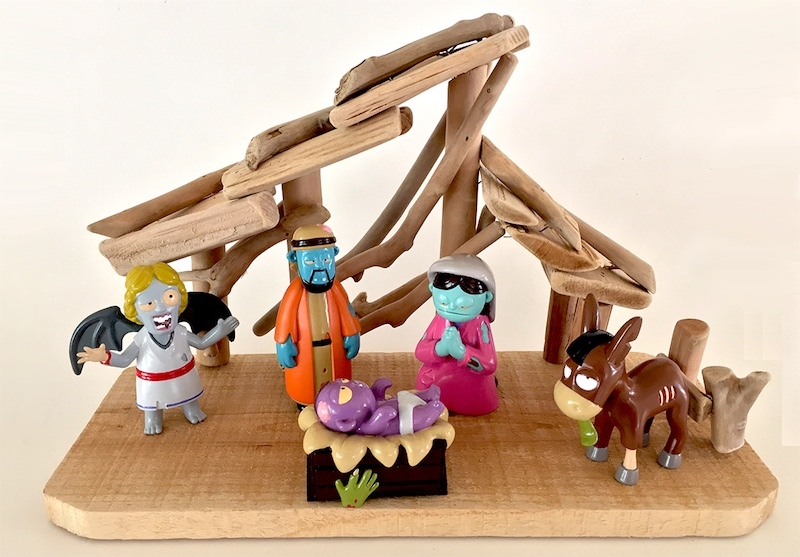 Phoenix-based NerdTalk Toys may have an answer in the form of a new Kickstarter project: The Zombie Nativity. And yes, it is exactly what it sounds like, The press release describes it as "...a vinyl desktop collector set that includes zombie versions of Jesus, Mary, Joseph, the Angel and an undead Donkey..." It should appeal to fans of zombie Jesus, as well as those of us who are more generally fans of the zombie genre. The company suggests that we can, "Put it up at Halloween, leave it out 'till Christmas!" Easter (i.e., Zombie Jesus Day) seems like yet another opportunity to display it. There aren't many decorations that one can pull out so many times a year. Ashley Gojic, CEO and Founder of the company, identifies herself as an atheist and believes that we may be a significant portion of the target audience for this product. So if you are looking for an interesting gift for one of the atheists on your list, now you have another one to consider: The Zombie Nativity.